Lead Gen will never be the same again! 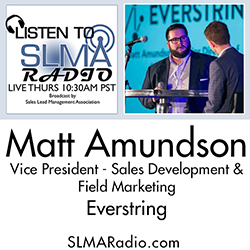 Vice President of Sales Development & Field Marketing at EverString. With more than 10 years of sales and marketing experience, Matt has held roles in Demand Generation and Sales Development at TIBCO, Marketo, Foster Grant and Red Bull. His primary focus is on creating processes that generate consistent, closable pipeline. Matt is a graduate of UCLA and also participated on the football team, so expect plenty of references to sport, teamwork and the power of coaching.